Over the holidays, Governor Cuomo went on a publicity tour for three new subway stations on Second Avenue. Millions of New Yorkers, meanwhile, continued to squeeze onto crowded platforms and deal with ever-more-frequent train delays. This weekend advocates put pressure on Cuomo to pay more attention to the basics — providing reliable subway service throughout the system. According to MTA metrics [PDF], the number of weekday subway delays per month jumped 332 percent in four years, increasing from 18,255 in November 2012 to 60,274 in November 2016, the Riders Alliance reports. But instead of addressing faltering subway service, Cuomo has made cash-less bridge tolls, a shinier Penn Station, and AirTrain boondoggles the cornerstones of his transportation agenda. On Second Avenue, Cuomo personally intervened to get the project ready for service by January 1. Now that the cameras are gone and riders are confronted with higher fares and deteriorating service, the governor has moved on. 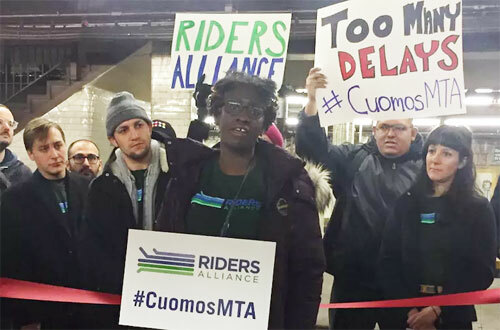 Riders Alliance members gathered at the Chambers Street J train platform yesterday to call on Cuomo to devote the same urgency to fixing daily subway service. “We need that same kind of leadership for the whole system, not just big, splashy projects,” said Riders Alliance organizer Masha Burina. While subway service becomes less reliable, the price of a MetroCard is set to rise and Cuomo’s budgeting practices practically guarantee a steady diet of fare hikes in the future. MTA debt has grown significantly since Cuomo took office in 2011, meaning more of the MTA’s budget is consumed by debt service, which leads to higher fares. Last year, instead of following through on a promise to devote direct state funding to the MTA capital program, Cuomo raised the MTA debt ceiling, setting the stage for more borrowing and more fare hikes. Tell me about it. Where was Cuomo when it took me over an hour to get from 125th to Wall St on the Lex? A few decades ago, we began to reduce braking capabilities on our trains, so that passengers would not be jolted around so easily – especially when trains had their brakes put into emergency (often by vandals pulling cords). While this resulted in fewer injuries and lawsuits, and less damage to rails and trains (and their wheels), it also contributed to a deadly crash on the Williamsburg Bridge in 1995. Following the Union Square crash in 1991 and Williamsburg Bridge crash in the 1995, we also reduced acceleration capabilities, and have been modifying our signals to increase safety by adding more grade-time signals (essentially, approach-controlled signaling) to lower speeds, and by lengthening control lines. In theory, these modifications were not supposed to increase running times significantly during normal operations. However, this theory did not work out in practice, as it did not account for human variability and errors and incidents. We’ve learned that keeping trains further apart makes it harder to recover from incidents, as more trains can become impacted and delayed. Also, slower crews (due to a greater emphasis on safety, as well as a distrust of the accuracy of the grade-time signals) and an increase in probationary crews (who have slower running times than other crews) have increased running times. Moreover, crew variability even creates incidents, because some crews will go slower (especially through timed signals) than other crews, and this can cause gaps and bunching; all of this is more pronounced with more timed signals, longer control lines, more slow crews, and a greater emphasis on safety. A crew going 10 mph slower through a 35 mph zone is proportionally going to create a lot less variability than a crew going 10 mph slower through a 25 mph zone. Thus, some trains may even become crowded and dwell times may increase, but usually as a result of our own service delivery and management practices. During incidents, we will attempt to even out service, which will help to keep the problem from getting even worse, but nevertheless, delays will increase and schedule adherence will decrease. Many times there is no “incident”, but because the train still arrives at the terminal late, an incident must be recorded, and this is often recorded as “crowding” or “excess dwell time” and is attributed to customers. Even though total ridership in 2016 slightly declined from 2015, these types of delays continue to dramatically increase, but dispatchers may not want to blame operators for operating slowly, and unions and management continue to overemphasize safety and blame heavy ridership. All of this added running time will require more trains and more crews, adding costs and also potentially adding even more running time, especially since probationary crews are slower. On the L line, which is currently our only line with CBTC, our “crowding” and “excess dwell time” delays are extremely low, even after accounting for the line being relatively short and having no merges with other lines. This is because it is operated automatically, so the impact of slow crews is minimized (only conductors can have an impact), and the control lines and timed signals found on other lines are not needed with CBTC. The L has heavy ridership, which can cause more incidents and delays, but not these long-term types of delays. When you're tweeting from that hot, crowded subway platform -- or a hot, crowded train that isn't moving -- don't forget to channel that frustration toward the man who runs the MTA: Governor Andrew Cuomo, whose Twitter handle is @NYGovCuomo.